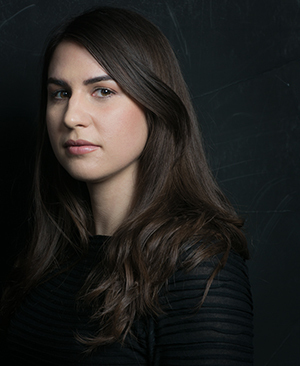 Azareen Van der Vliet Oloomi, assistant professor in the University of Notre Dame’s Department of English, has been named one the National Book Foundation’s 5 Under 35. The honor is bestowed to top young fiction writers selected by past National Book Award winners and finalists. Van der Vliet Oloomi, the author of Fra Keeler, was chosen for the list by novelist Dinaw Mengestu, who was a 5 Under 35 honoree after publishing The Beautiful Things That Heaven Bears in 2007. The five honorees were recognized at a ceremony in New York on Nov. 16 hosted by TV star and producer LeVar Burton. They will participate in the 5 Under 35 Reading Series, presented by the foundation and the Library of Congress, and also appear at a special event in Miami, Florida, in the spring in conjunction with Miami Book Fair International. In March, Van der Vliet Oloomi was named a 2015 Whiting Award winner for “early accomplishment and the promise of great work to come.” Previous winners include Jonathan Franzen, Alice McDermott, and David Foster Wallace. Van Der Vliet Oloomi also recently received a fellowship from The MacDowell Colony, where she will be a writer-in-residence during the month of August. Her 2012 debut novel, Fra Keeler, earned critical acclaim for its “chilling,” “surreal,” and “humorously associative meditation” about a man who investigates the death of the former owner of his newly purchased house. The book has been translated into Italian, available from Giulio Perrone Editore in Rome this May. In addition, she is writing a collection of short stories—one of which was recently published in The Brooklyn Rail. Van der Vliet Oloomi recently taught an undergraduate course called Walking, Writing, Thinking to an “exceptionally engaged and talented group of students.” She also developed a rigorous graduate level literature seminar for M.F.A. students called Introspection and Voyage: Examining Narrative Across Time. Students read texts that range from the medieval to the contemporary, explore “the genealogy of radical literature,” and engage with literary traditions from around the world. Originally published by Arts and Letters at al.nd.edu on December 03, 2015.